If there's one thing you can say about Lions, it's that we're patriotic. For decades, the Conway Noon Lions Club has opened our meetings with by having an invocation and reciting the Pledge of Allegiance to our flag. On Independence Day in July of 2008, the Conway Noon Lions Club began a new fundraiser for the club, the Patriot Project. We want to encourage our friends, neighbors, and local businesses to show their patriotism on every major national holiday during the year. To support this effort, the Conway Noon Lions will mount and display the American Flag at the front of your business on each of these holidays for a subscription price of only $50 per year. 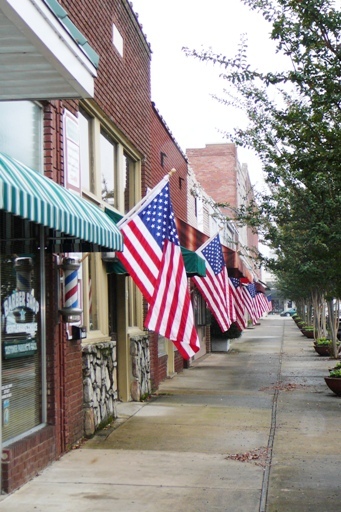 Our goal is to have every business in Conway flying Old Glory. We provide the mounting hardware, bracket, and a quality flag...all you have to do is write the check. It's that easy! We look forward to flying the flag in front of your business! Lions Clubs International is pleased to announce that it has entered into a collaborative agreement with Wal-Mart to collect used eyeglasses from the public at Wal-Mart and Sam's Club stores throughout the United States. Co-branded eyeglass collection boxes, bearing both the LCI and Wal-Mart logos, are now available in the 2,500 Wal-Mart stores, and 500 Sam's Clubs, with vision centers. These new boxes will replace existing Lions collection boxes currently in place at the specified stores with vision centers. For Wal-Mart stores and Sam's Clubs without vision centers, existing Lions eyeglass collections will continue at the discretion of the store manager. Wal-Mart will ship the collected eyeglasses to their distribution centers, where they will then be delivered to the nearest Lions Eyeglass Recycling Centers for sorting, cleaning and processing. Usable glasses will be available for Lions Clubs as they help people in their local communities and other optical missions to developing nations, where the glasses will be dispensed to children and adults free of charge. DONATE NOW! !